JJC LH-82 Lens Hood is designed for Canon EF 16-35mm f/4L IS USM Lens. The hood prevents unwanted stray light from entering the lens by extending and shading the end of the lens. It has a non-glare matte finish on the inside to further prevent or limit lens flare. There is no vignetting with the hood on. The "petal" shape of this lens hood maximizes the amount of hood coverage for the minimum amount of weight and hood area. It can also be placed backwards over the lens for a more compact storage solution. The hood allows you to put on a filter and a lens cap, too. In addition, since the end of the lens is extended, you also get the added benefit of some extra protection from accidental impact. 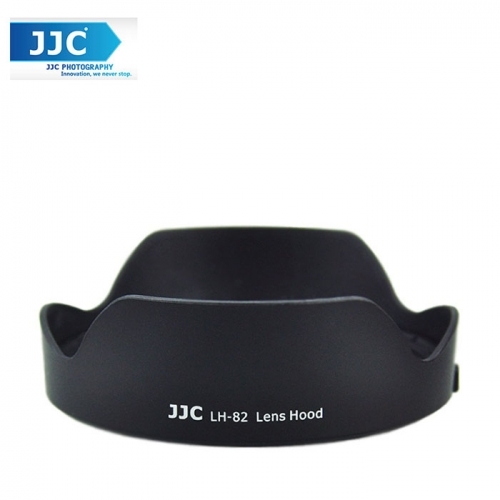 JJC LH-82 lens hood replaces Canon EW-82.